Israel’s President Reuven Rivlin addressed ambassadors to Israel from around the world at a special ceremony to mark International Holocaust Remembrance Day, held in the synagogue at Yad VaShem Holocaust Memorial and Museum in Jerusalem. 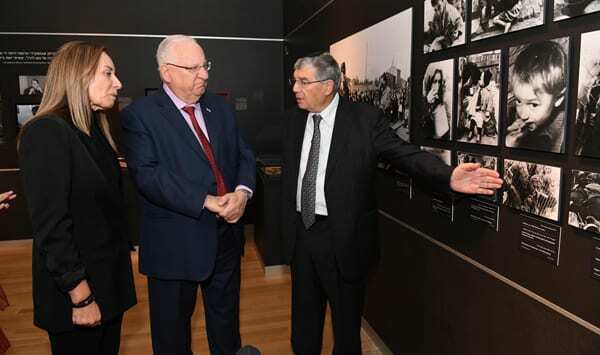 After his address, the President was accompanied by Yad VaShem chairman, Avner Shalev, on a tour of the new “Flashes of Memory” exhibition which presents rare photographs taken by Jews during the Holocaust. The “Flashes of Memory – Photography during the Holocaust” exhibition presents visual documentation from during the Holocaust, focusing on the circumstances of photography and the worldview of the documenting photographer, referring to the unique and different viewpoints of the Jewish photographers. The exhibition features nearly 1500 images, including photographs, albums, diaries and newspaper pages.